Medeco is a quality brand for highly secure locks that Bee Safe and Lock finds very reliable and trusted. Patented Key Duplication Control – This protects against unauthorized duplication of Medeco keys, only those authorized by you can make copies for your house or business. 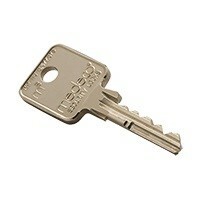 Special Angle Cut Keys – Medeco keys require a special key cutting machine and are cut on specific blanks. Use in existing hardware – Medeco cylinders can be used in existing hardware for deadbolt and key in knob hardware in most locks. Picking and Bump Protection – Medeco M3 cylinders have a side that prevents the key from rotating until it is in the correct positions which protects it from picking and bumping.